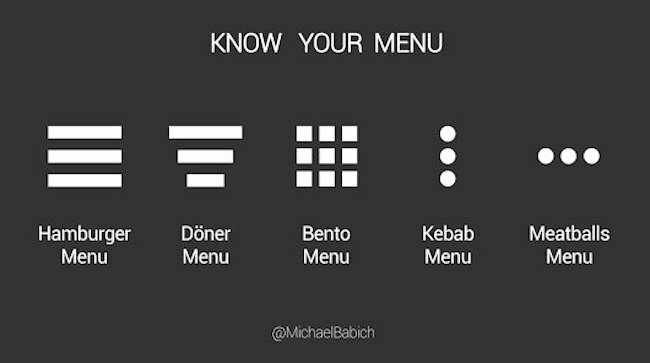 A play on the icons used on computer platforms for various ways of displaying information, likening the shape of the icons to the shape of kinds of food (a hamburger, döner kebab on a vertical rotisserie, a bento box, a kebab on a stick, meatballs). And exploiting the ambiguity of the noun menu — in its older sense in a food context and in a metaphorical sense in computing. noun menu: [a] a list of dishes available in a restaurant: the waiter handed her a menu| figurative : politics and sport are on the menu tonight. [b] the food available or to be served in a restaurant or at a meal: a no-fuss dinner-party menu. [c] Computing a list of commands or options, especially one displayed on screen. Sense [c] is a metaphorical extension of the ‘list of dishes’ sense [a]. This entry was posted on April 1, 2018 at 1:47 pm and is filed under Ambiguity, Language and food, Language play, Linguistics in the comics, Metaphor, Technology. You can follow any responses to this entry through the RSS 2.0 feed. You can leave a response, or trackback from your own site. Commenters on Facebook have vigorously advanced replacing the name bento by waffle.